The adventure continues! Click here for our return trip! 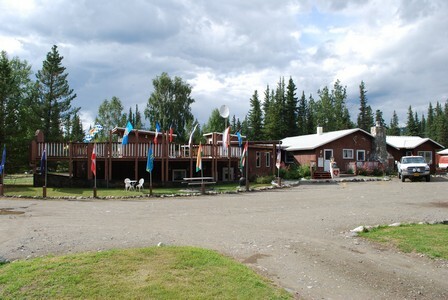 This place is about halfway between Glennallen and Tok Alaska, it's a nice stop, full services and we are the only people here. 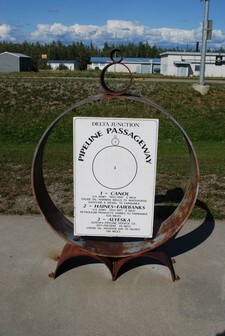 The facility is great, a hotel and RV campground run by a widow, it's currently for sale. The lady is an artist, she does bronze statues and other great stuff, we bought some gifts here. We drove all of 100 km. or so in heavy rain to this great campsite, it's like a provincial park with sites along the river with water and electricity. The rain stopped later in the afternoon and we had some time outside near the river. We didn't take any pictures, maybe tomorrow morning. 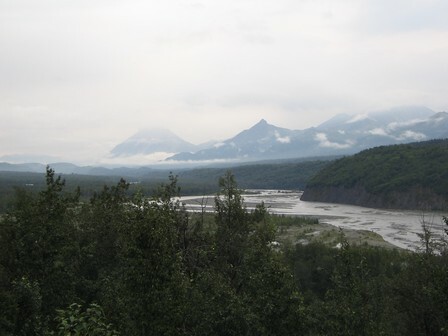 We are enjoying some of Jim & Suzie's fantastic smoked salmon and taking in the Alaskan views! 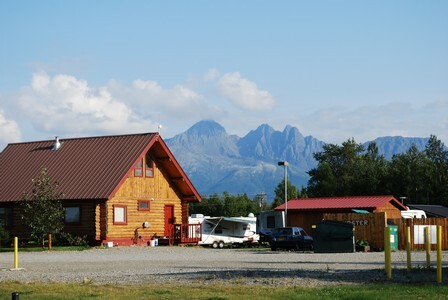 We are stopped at the Grand view RV park on the Glenn highway, the campsite has a great view of the mountains. 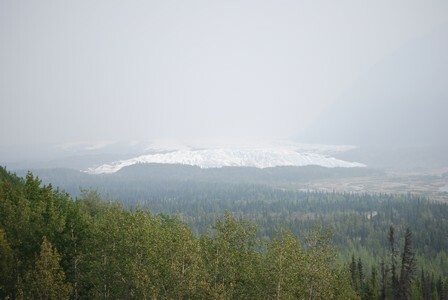 The Matanuska glacier is about 10 miles down the road and we went back to take some pictures. Making the turn for Home! 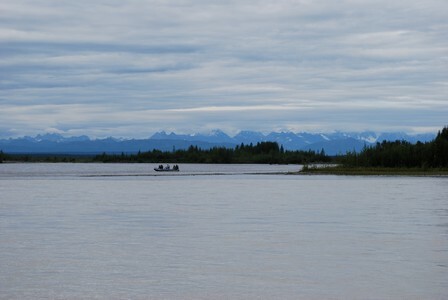 Yesterday we rolled out of Jim & Suzie's place in Sterling and we stopped overnight here in Wasilla. 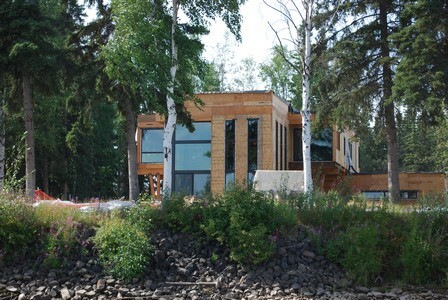 The visit was tremendous, we enjoyed great food, fantastic company and the best of Alaska. 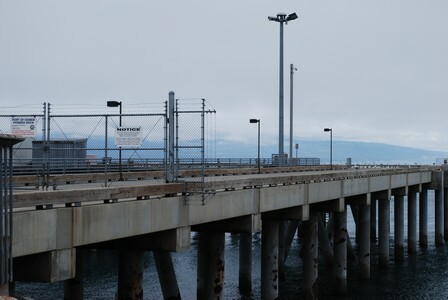 We still have some pictures and commentary to post about our day trip to Seward on Thursday. Stay tuned. 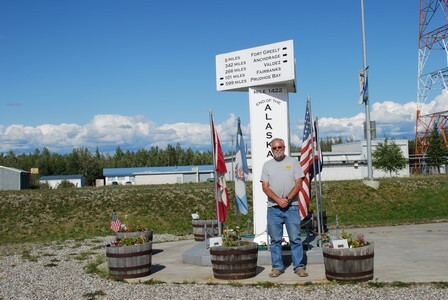 Today we hit the Glen Highway and head slowly back to the Alaska Highway at Tok. We are parked in a meadow of friends Jim & Suzie who we met while in Mexico. 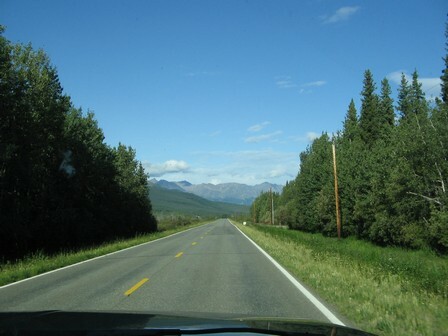 They live near Sterling on the Sterling highway. They have generously allowed us to park the RV here and they are plying us with home smoked salmon and and other local seafood, we are being spoiled and are very thankful! 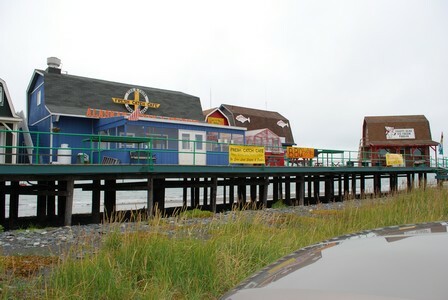 We took a day trip into Homer today, it's the end of the Sterling highway and about as far west as you can go by car in Alaska. 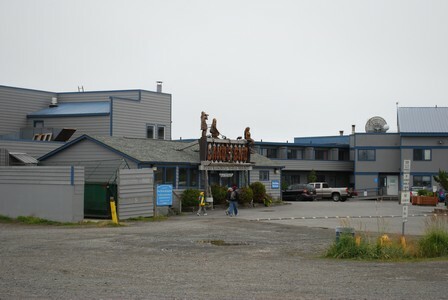 Yes, it must be the end of the road since the hotel has the same name! Prior to staying here in Sterling, we stayed for a night in Hope, and before that we stopped in Anchorage. 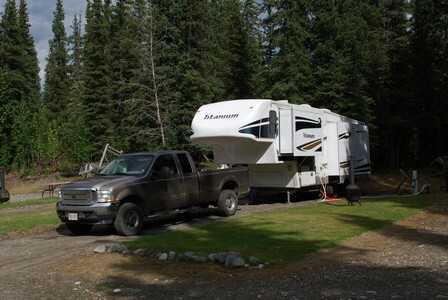 This morning we headed to an RV park closer to Anchorage but it was full. 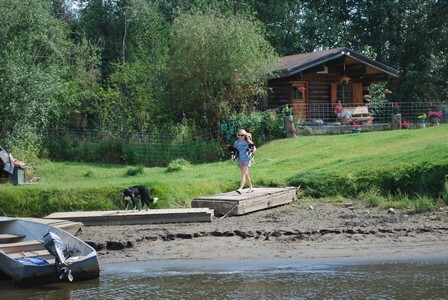 We returned to the Wasilla area and found another park. 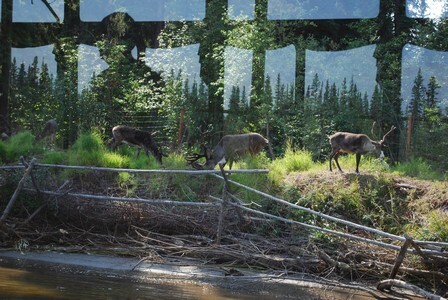 After, we drove into Anchorage and looked at a park and we reserved a site for tomorrow. 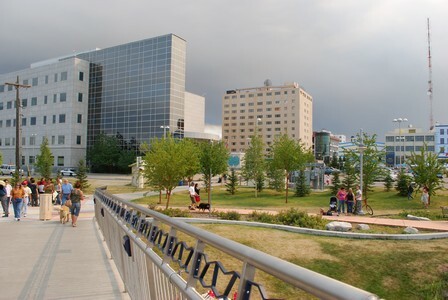 We don't particularly like staying at city parks, but we want to see some of Anchorage before we head down the peninsula. Not a great park, but it's OK for overnight. We are in Sarah Palin territory! 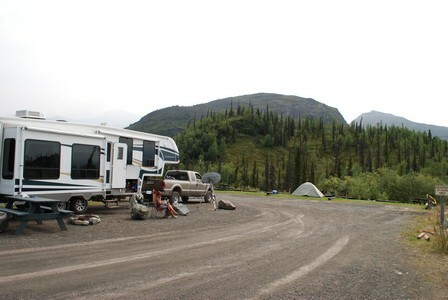 It's getting busier as we head towards Anchorage, but so far RV sites have been easy to get. 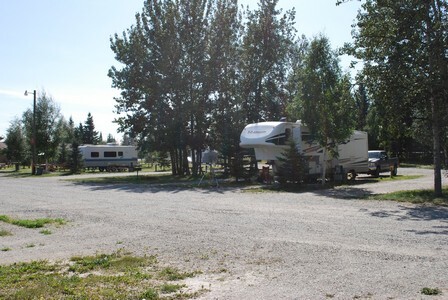 This RV park isn't one to write home about, its a gravel lot but it has full services and a good laundromat. 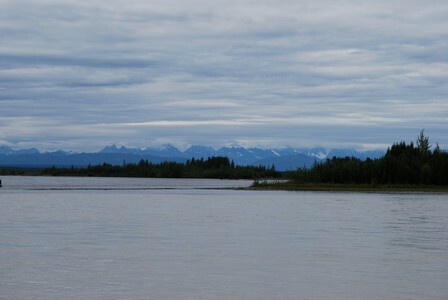 It's been raining on and off for most of the day here and there are flood warnings for places not too far away, but we should be ok.
We are in Talkeetna Camper Park near Talkeetna Alaska. 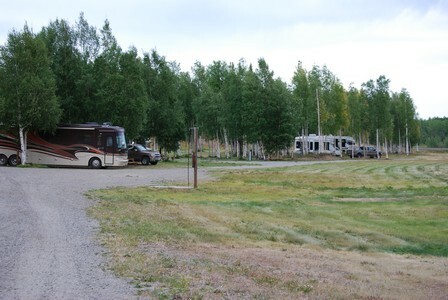 Last night we stayed at Byers Lake campground in Denali State Park, a nice state park but in the trees and no services. 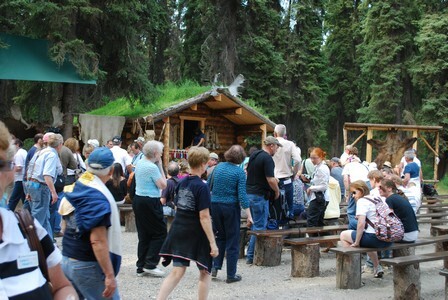 Talkeetna is more touristy, with lots of places to eat and drink. 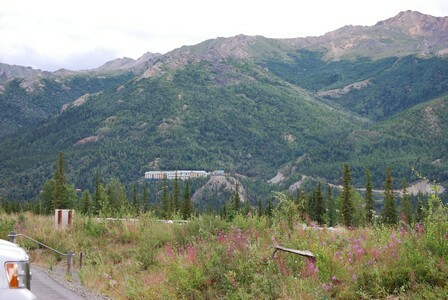 It's a hopping off location for train, air and river travel to Denali National Park. We have enjoyed our stay here , we dropped into a medical clinic for some needs and they were responsive and efficient, we also loaded up on provisions close by. 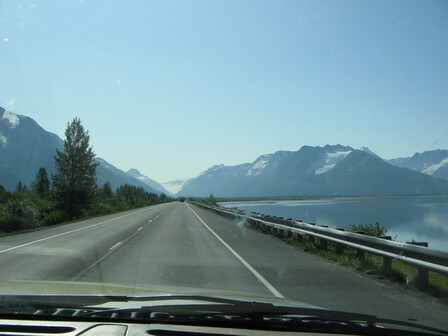 Tomorrow we head south to Wasilla, then after that towards Anchorage! Just like the old TV commercial "wheres the beef? 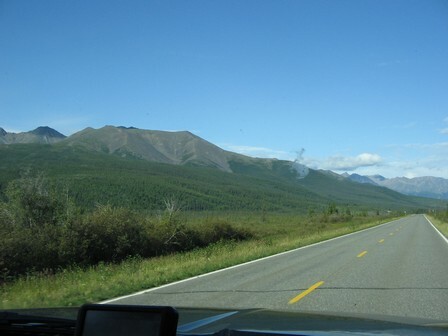 ", we checked out Denali National Park by driving the 11 miles or so into the park that you can drive in a private vehicle. We were underwhelmed, to put it mildly. 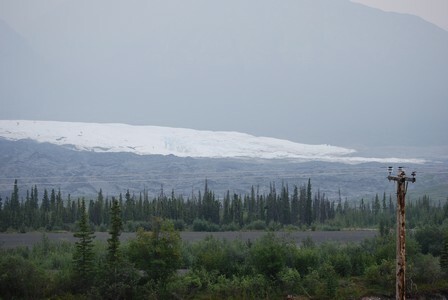 No Mount McKinley to be seen, and not much else! 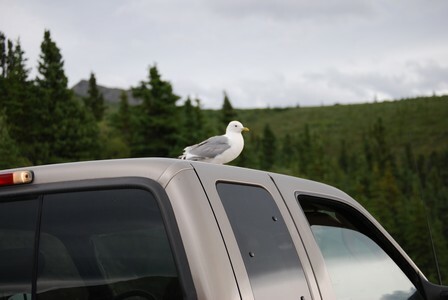 The drive was uninspiring, no wildlife was seen (except for the specimen below) and a couple of pictures were taken. This cost us $20.00 for a pass, we could take a bus along with a bunch of others on a 6 hour tour (think "cattle car") tomorrow for about $50 per person, but we don't think so. We haven't been to a lot of US national parks, if this is an example of a good one, then it's sad, the national parks in Canada are much better, try Banff and Jasper for better access and more wildlife. 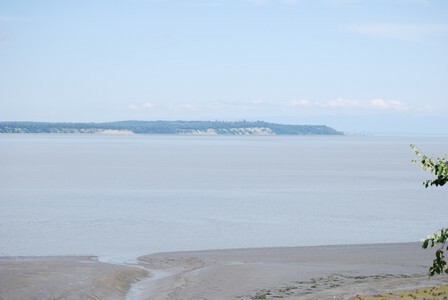 We booked a campsite here for tomorrow night as well, but we may pull out tomorrow morning as there isn't anything else worth seeing here for us. 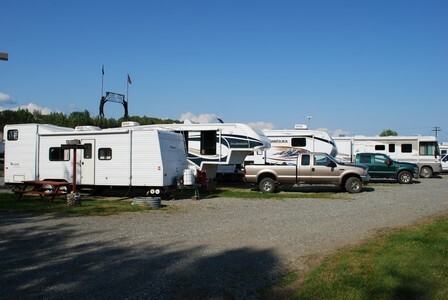 We are in the the Tetlanika Trading Company RV park, it's a jem of an RV park, 21 sites and even has it's own airstrip! 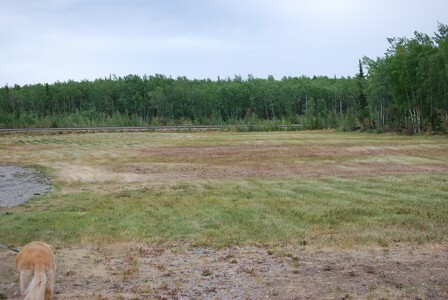 Some of the campsites are along the edge of a grass landing strip, the owner has a small plane (probably a Cessena). 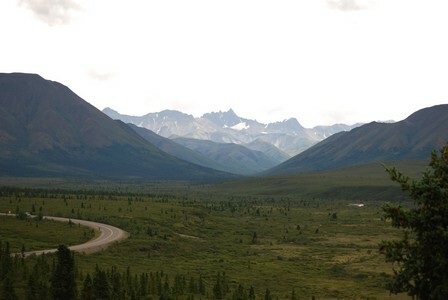 We have stopped here overnight and we will hit the Denali area tomorrow. 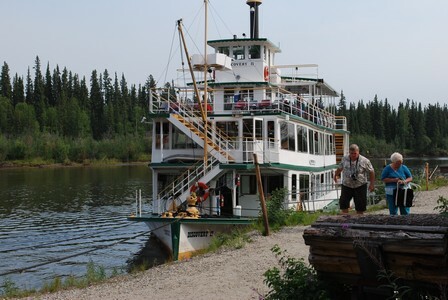 We took the discovery Riverboat cruise and enjoyed it very much! It was a little "touristy" with 10+ tour buses dropping off folks for the cruise, but it was still good. As I'm writing this, we are inside the trailer to get away from the falling ash from the forest fire nearby, it feels like being downwind from a smoky campfire! 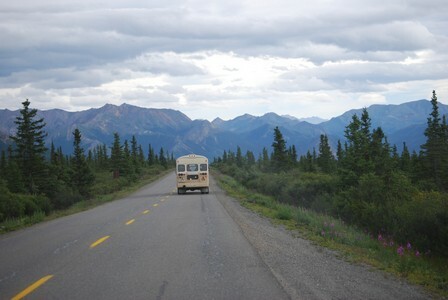 We pack up tomorrow morning and head toward Denali! 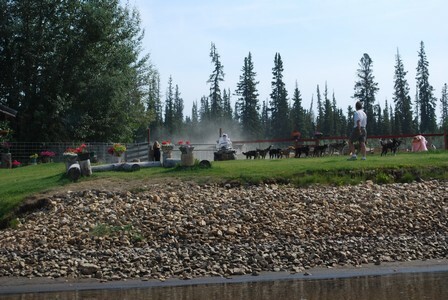 We got here yesterday just after lunch and since we are only about 10 minutes out of Fairbanks at a nice place called Riverview RV park, we decided to stay here instead of camping in downtown Fairbanks. We took the drive in yesterday to look around and we took a couple of pictures. 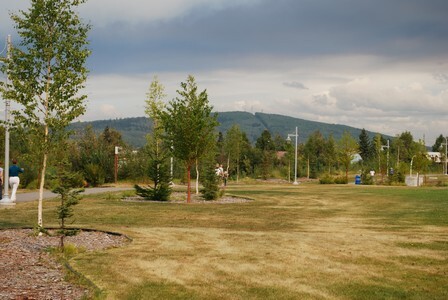 Some nice walking paths in town. Notice how dried out the grass is here, southern Ontario folks eat your hearts out! 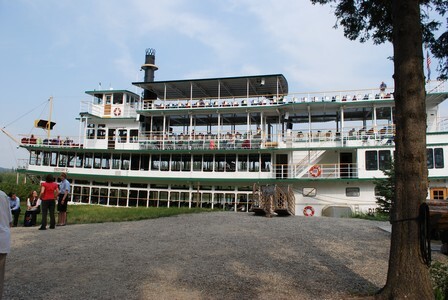 We have booked a ride this afternoon on a paddle wheeler that goes through the area, pictures later! 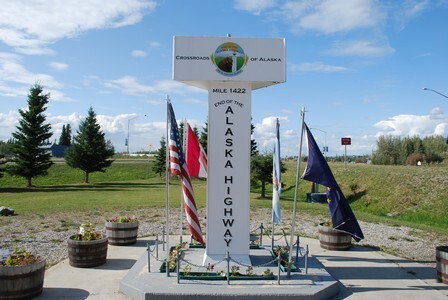 We are here at the official end of the Alaska Highway, we change to the Richardson Highway which goes from Valdez to Fairbanks and head to Fairbanks tomorrow. 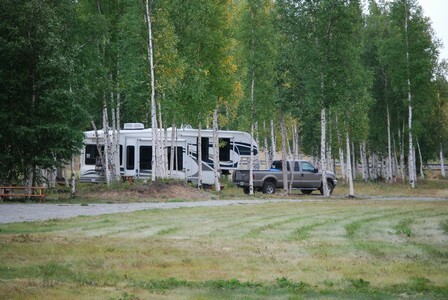 We stayed in Tok at a nice RV park last night, but couldn't get on-line because of trees. The park had wifi but were charging for it, and the signal strength was low, so I declined. We took the opportunity to have an extra waste valve installed in the RV as a temporary measure, the original valve was leaking. I had it in to Morry's to fix it, but they didn't. 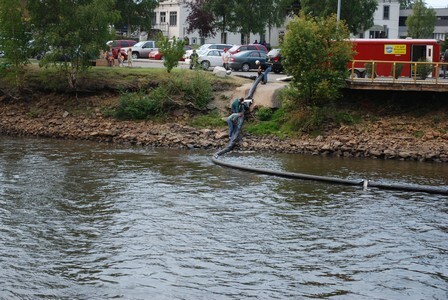 It's no fun dealing with yellow liquids at dump sites! 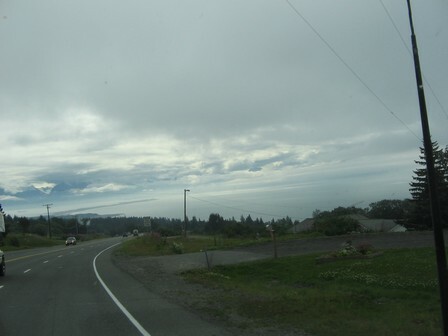 Nice straight roads with mountains in the distance! 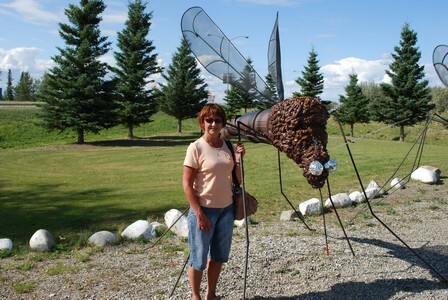 Yup, they grow the mosquitoes pretty big up here!